All free, no funding and without the use of electricity. Please help to make this a no waste event by bringing your own drinks and snacks and taking home your re-usable containers. All organisation, workshops and activities are provided by volunteers and all materials by donation. We’ll put out some tables, supply some orange juice and ice, rig up some shade and provide a nice venue. You’ll bring a plate or dish of brunchy type food to share, chair, eating equipment (own plate, cutlery, cup etc and napkin if you’re posh), friends and family. Come and join us from 4:30. See flyer below. Come along and have a go. This will be a hands-on day of activities for everyone. See flyer below. Bring your own food, drink and chair. Take home any waste. Bring pizza toppings to share. Please let us know if you might be interested in donating your time or any materials to help on the day. 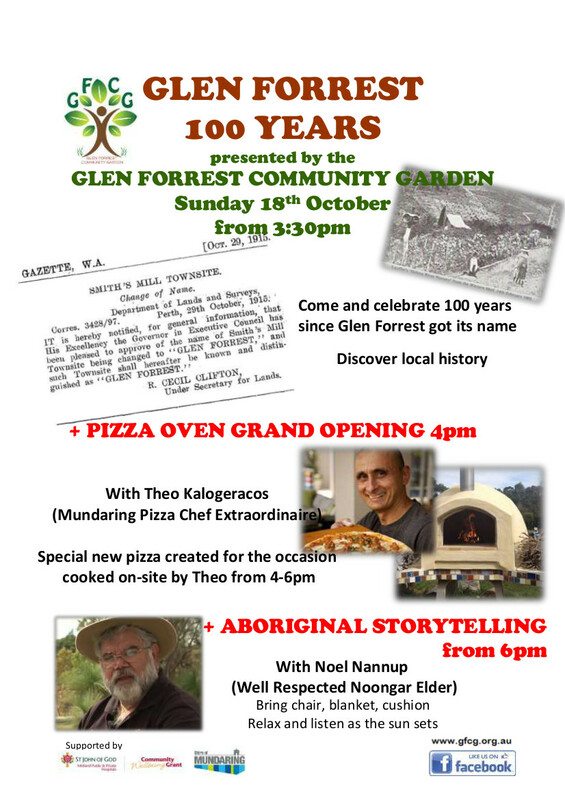 Grand Pizza Oven opening will be part of this event. 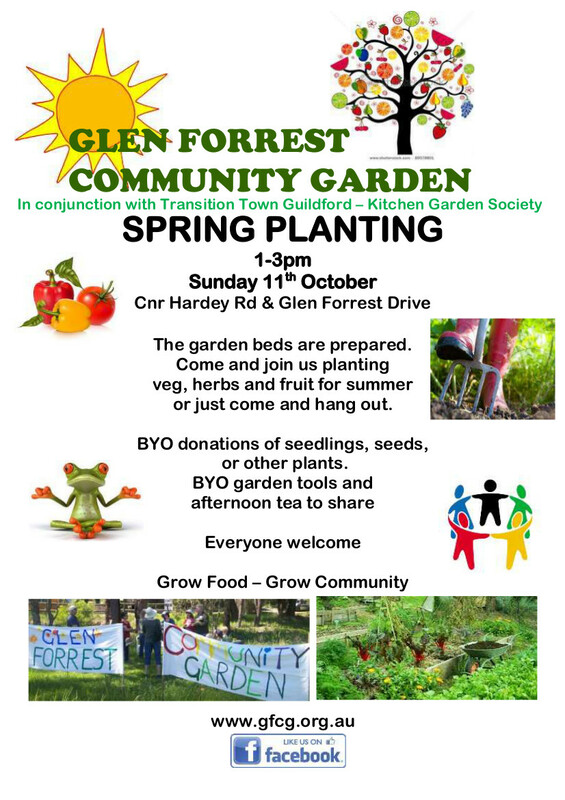 In conjunction with Transition Town Guildford Kitchen Garden Society. Come along and help plant out the community garden with spring veg. All donations of seeds and seedlings will be gratefully received. 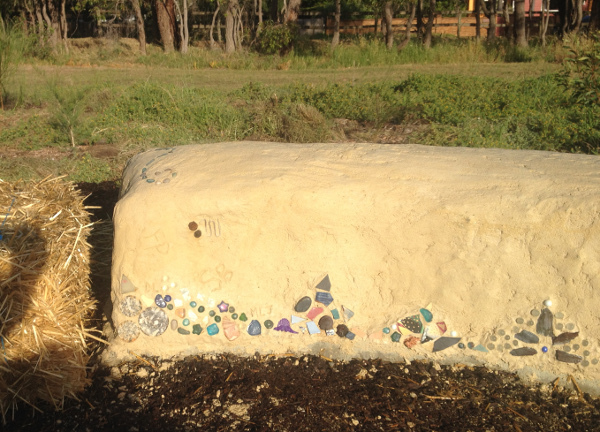 Come along and help create a mosaic mural to cover the bench around our new Pizza Oven. Design will include images of fruit and veg. Everyone welcome. Bring tiles (plain colours preferred), your creativity and morning tea to share. If you have any tile cutters or other relevant tools it would be great if you could bring them too. 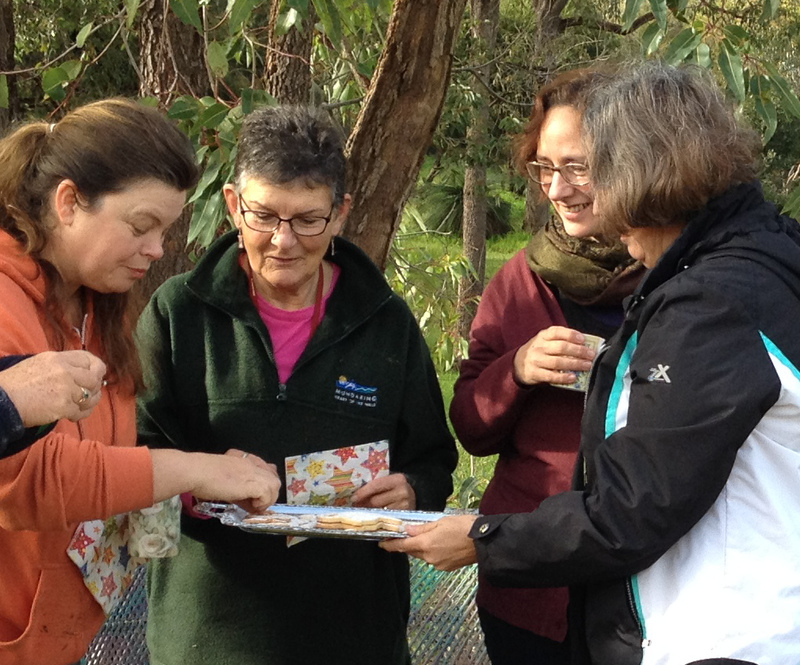 Come and join us for a fun and frivolous Long Table Lunch at the Garden to celebrate the Winter Solstice. 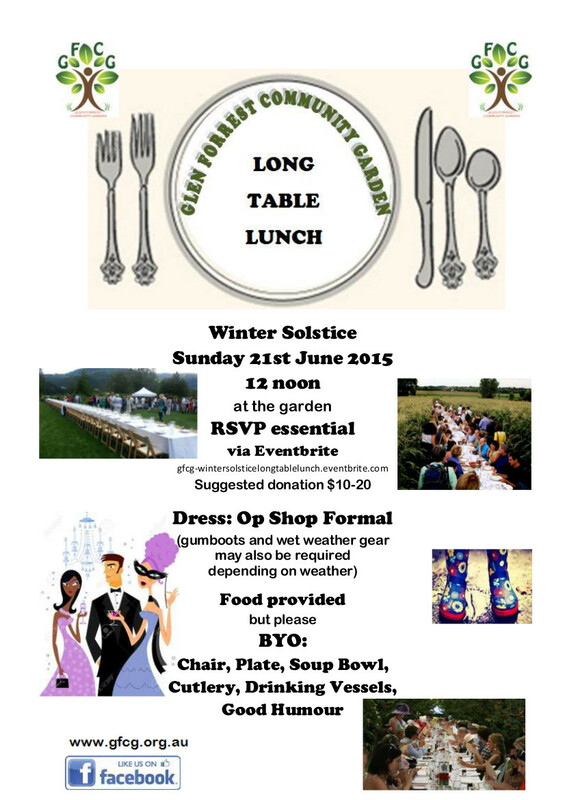 Bookings are essential at gfcg-wintersolsticelongtablelunch.eventbrite.com or with one of the garden members. 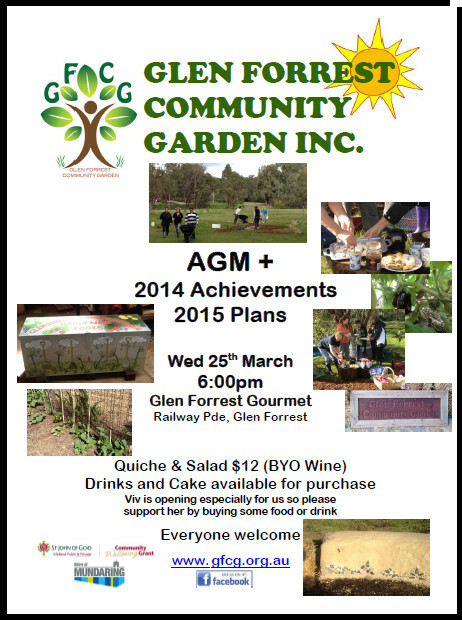 The Glen Forrest Community Garden Inc. will be holding its 3rd Annual General Meeting on Wednesday evening 25th March at the Glen Forrest Gourmet. Please come along and celebrate our achievements over the past year and see what we have in store for the next 12 month. See flyer below. ‘Strawbale Selene’ lead us through the art and science of strawbale building over three Sundays in November. Our North East Piazza is coming to life with two lovely seats. 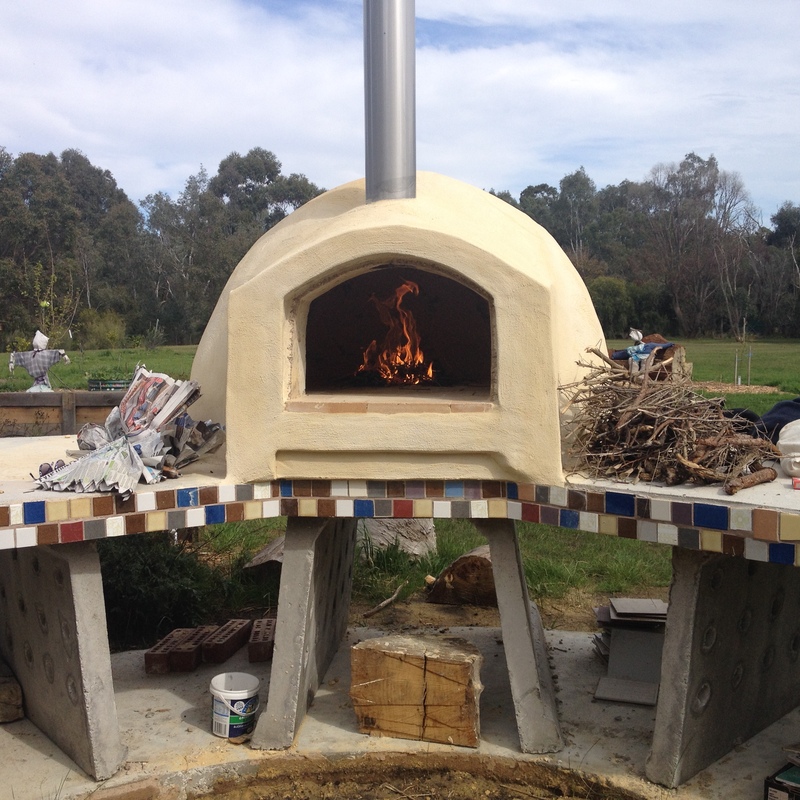 Check out how we went with Strawbale Workshop 1 which created the footings, Strawbale Workshop 2 which placed the straw bales and completed the first render and Strawbale Workshop 3 which finished off with the final render and mosaic and decorative features. Come and join us for the GFCG Spring Planting event. We’ve been preparing garden beds ready for a big planting day. 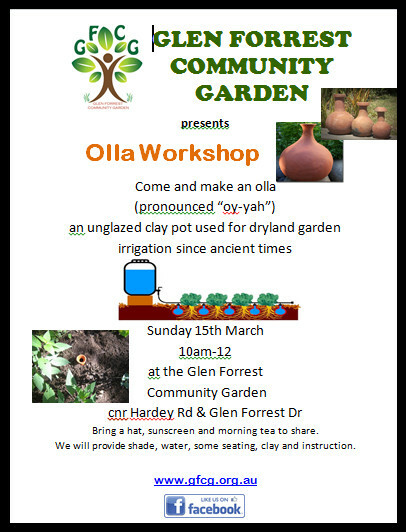 Bring you family and friends, some plants, garden tools, morning tea and your wellies. And watch the garden beginning to take shape. 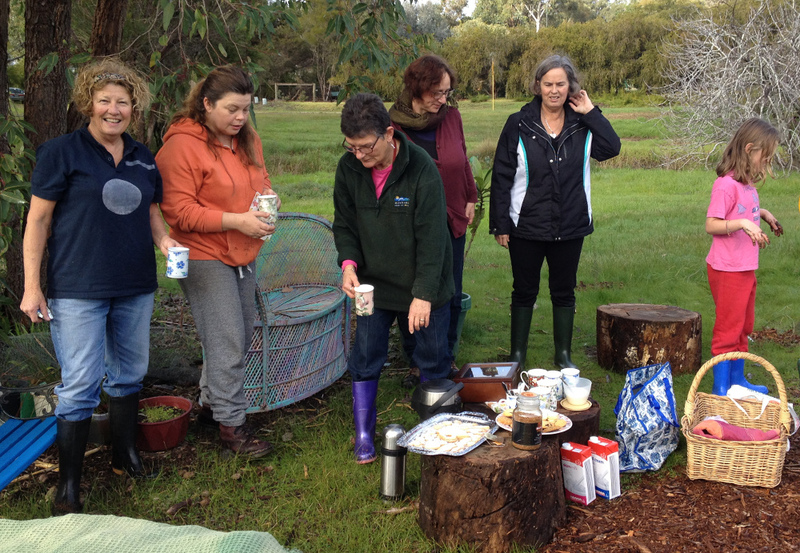 One Sunday Vicki brought along a most wonderful morning tea. We had tea from a tea-pot drunk from china mugs. 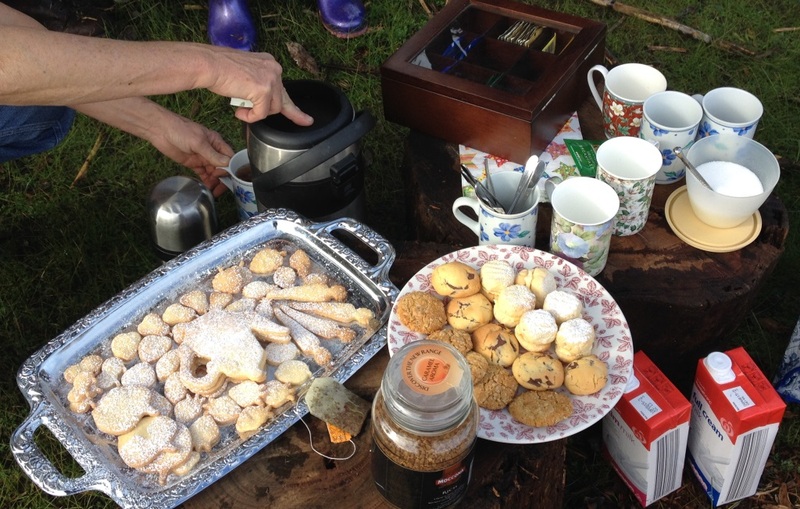 And we had an amazing array of biccies, including shortbread in shapes of all sorts of fruits and vegies – pears, plums, carrots. A great way to top off a morning of mulching. Thanks Vicki. We had a great AGM on the 19th with 16 people attending. Viv at the the Glen Forrest Gourmet supplied us with delectable quiches, incorporating pumpkin and rosemary grown in the community garden. We elected office bearers for our committee for the coming year and after due discussion and deliberation arrived, by consensus, at our choice of logo for the group. All will be revealed soon. 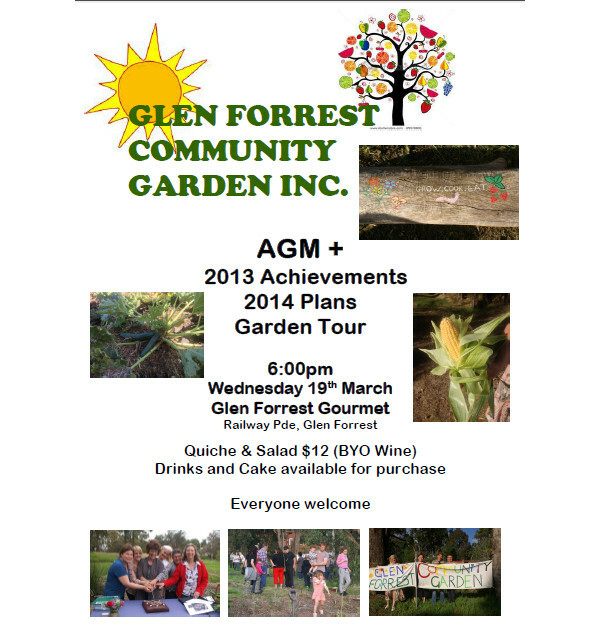 The Glen Forrest Community Garden will be holding its 2nd AGM on Wednesday 19th March 2014 at the Glen Forrest Gourmet Cafe on Railway Pde in Glen Forrest from 6pm. 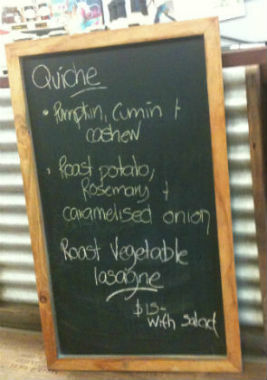 Viv is opening especially for us and will be supplying a discounted Quiche and Salad dinner for $12. Please let us know if you would like a meal. Other drinks and snacks will be available for purchase on the night. 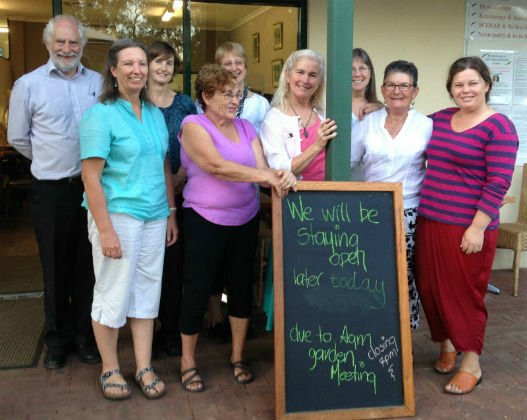 During summer we are meeting at the garden at 8:30am each Sunday. Please come and say hello. Sometimes we go over to one of the local coffee shops for a cuppa afterwards.